Towards the end of 2018 Google unveiled a new SERP (search engine results page) special content result block named Google Hotels. This is a prominent new feature has received criticism from a lot of people as Google continues to move away from being a pure search engine, to more of a web portal (a lot like Baidu, Naver and Yahoo have been for years). This is an expansion of a pre-existing hotel feature, Hotel Ads, and now includes photos, reviews, prices, and amenities, amongst other things. This is a big step. What does Google Hotels that’s different to other OTAs?? There are already a number of OTAs out there, so Google is entering a crowded (not saturated) marketplace. So what have they done to make themselves different? Meta-search based OTAs like Trivago, Kayak, Travel Supermarket et al only show one room (and room rate) per booking website. This can make for an unfair (and potentially biased) comparison for users. Google Hotels however allows users to view all available room types as well as their rates without having to leave the single page. This is a lot better for users, and allows them to make more informed decisions. Google have access to a lot of data, and they’ve flexed this a lot in their hotel pages. Using a local example, you can see how they’ve structured their hotel pages below to include the maximum amount of information for users. 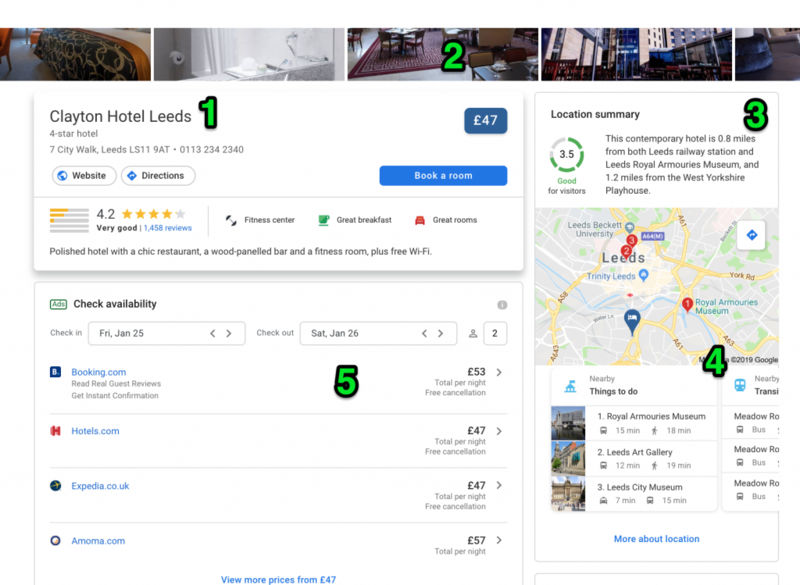 This approach (and information included) is something I’ve advised a lot of OTAs and groups to do over the years – and for smaller, independent accommodations – this is pretty much everything you should be doing across your website, only condensed on a single page. Above the fold on a Google Hotel page. Similar to the SERP feature and Google Map Pack listings, basic information, review stars, directions and a room rate. Images of the hotel all across the top of the page – no need for a user to click through single images at a time in a gallery. 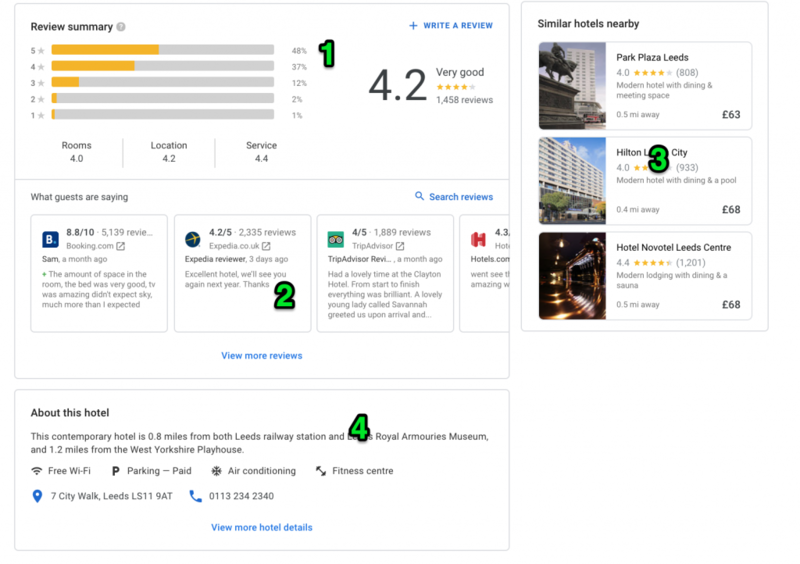 Location summary score, based on local travel links and attractions – from what I can tell, there is some correlation between this and the reviews left on other businesses (things to do, travel links etc), as well as scoring from Google Local Guides… But this is only a correlation. An expanded things to do, including map markers. Below the fold on a Google Hotel page. Review summary for the hotel, including prompts to leave a review – and breakdown based on the room, location and service quality. Reviews pulled from third-party sources including Booking.com, Expedia.co.uk, TripAdvisor, Hotels.com, and Orbitz.com – this is also updated regularly, at the time of writing this the most recent review on this hotel was 20 hours young. 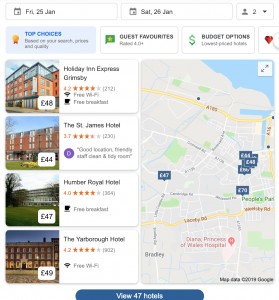 The similar hotels panel is actually sticky, and stays with you down the page once you reach it on scroll – so even if you’re deciding against the hotel you’re looking at, you can one-click to a similar offering without conducting a further search (all on Google). Hotel information and amenities, weirdly at the bottom of the page. By including images prominently within search results like this, Google has taken a step towards being an OTA (online travel aggregator), meaning users use them to book a hotel rather than a price comparison site – meaning that your SEO strategy for your travel brand needs to be more refined and on point than ever. This makes for a great user experience, especially on mobile devices. If you want to learn more about Google Hotels, PhocusWire have written a great overview covering everything from RBMs (Room Booking Modules), to the pros and cons of the platform. Tracking within Google Hotels (as a meta search engine), is not yet available on scale through tools.